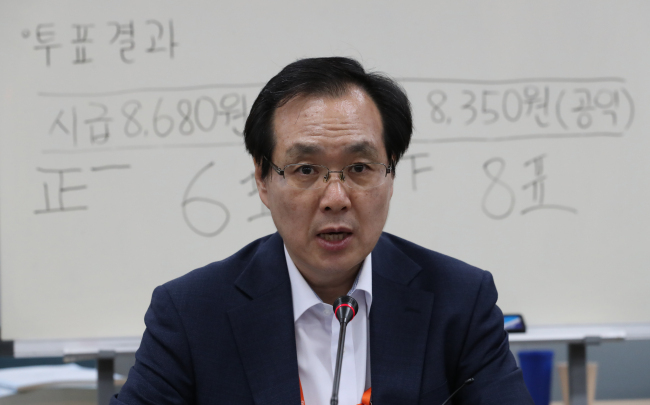 South Korea's minimum wage for next year has been set at 8,350 won ($ 7.37) per hour, up 10.9 percent from this year, officials decided on Saturday. The decision was made after the Minimum Wage Council -- a panel comprised of representatives from labor, management and the general public -- had a 19-hour meeting overnight to meet the deadline. This is the first time in history that the country's minimum wage will surpass the 8,000 won-mark. Monthly salary at the minimum wage -- based on a 40-hour workweek -- will be 1,745,150 won. Among 27 members, nine representing the management community boycotted the meeting. Five members representing the labor community and nine members from the general public side attended the meeting to vote for the minimum wage for 2019. With no management members at the table, minimum wage proposals from the labor side (8,680 won) and the general public group (8,350 won) were put up for a vote. The latter earned eight votes and was chosen as the minimum wage for 2019. This year's minimum wage stands at 7,530 won per hour, up 16.4 percent from a year ago, the biggest hike in nearly two decades. The minimum wage for next year increased by a smaller amount, and experts are speculating that the council is controlling the level of the hike following criticisms that small business owners are suffering from increased labor costs. President Moon Jae-in has vowed to increase the threshold to 10,000 won by 2020 to achieve income-led growth. With the latest decision, however, it isn't likely that this goal can be achieved in time. Assuming that increase rates will be the same for 2019 and 2020, at least a 15.2 percent hike was needed this time. Both labor and business communities were not satisfied with the decision. The representatives for labor have demanded a 43 percent increase to 10,790 won, while those from the business side have called for a freeze. Those from the labor side said the result didn't give hope to low-wage workers, while people from business circles said wage hikes with two-digit increase rates for two consecutive years will further pressure small business owners.